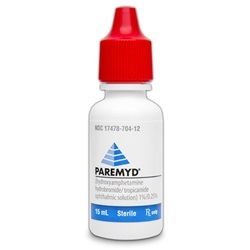 Sterile, Mydriatic Paremyd 1% - 0.25% ophthalmic drops in a 15 mL dropper bottle. Generic drug name is hydroxyamphetamine hydrobromide and tropicamide. Manufactured by Akorn. NDC Number: 17478-0704-12. Comes as singles.